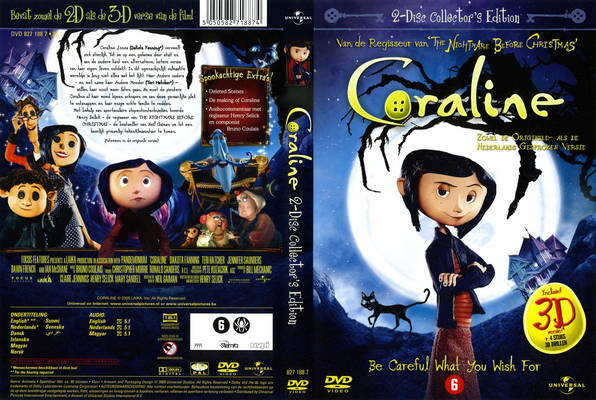 Based on the 2002 Neil Gaiman novel, "Coraline" (2009) is a fine feature film that uses stop-motion animation. This form of animation has a very long history, going back to the 1897 children's film "The Humpty Dumpty Circus," and its most successful use was probably the fun 1964 holiday special Rudolph the Red-Nosed Reindeer. However, recently it has been used to convey, instead of childish innocence, a slightly more creepy sensation. 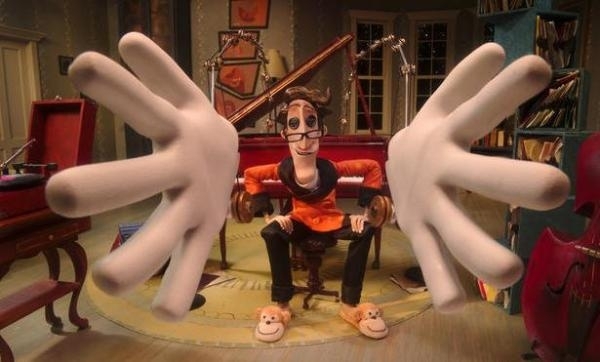 Long after directing Tim Burton's stop motion classic The Nightmare Before Christmas, director Henry Selick took on this project. 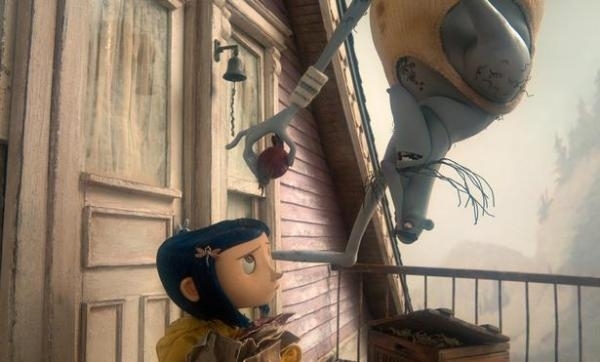 "Coraline" is a worthy successor to the Tim Burton holiday classic, but reaches its own level of creepiness. 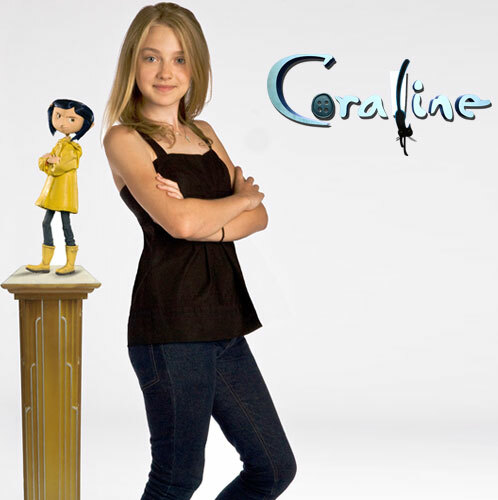 Coraline Jones (Dakota Fanning) has just moved into a run-down apartment in Ashland, Oregon with her mother Mel (Teri Hatcher) and father Charlie (John Hodgman). She is an inquisitive child, and very bored, so she goes exploring. Coraline befriends Wybie Lovat (Robert Bailey, Jr.), her landlady's (Caroline Crawford) grandson, tenants Miss April Spink (Jennifer Saunders) and Miss Miriam Forcible (Dawn French), and the curious blue Russian, Mr. Bobinsky (Ian McShane). Still, despite all these new friends, she feels neglected by her preoccupied parents who always seem more interested in their work than in her. There are odd things in the apartment building, and Coraline notices in particular a small door that is sealed off by bricks. That night, a mouse awakens her and leads Coraline to the door, which now is open and leads to a long, dark corridor. She goes through, and finds herself in an alternate world (the "Other World') where the people are the same, but everything about them is different. In the Other World, her mother and father have black buttons for eyes, which is a little off-putting. However, they pay a lot more attention to her, which is something that Coraline always wanted. She goes to bed in the Other World, but awakens back in her own world. 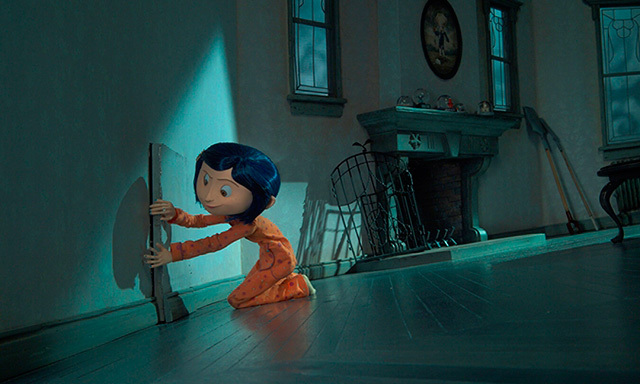 When Coraline mentions her experiences to the neighbors, they warn her to avoid the door and the Other World. Being curious, though, she can't resist. Each night, she goes through the small door and is welcomed warmly by her Other Mother. Her neighbors also exist over there, but Wybie is mute, though friendly. A black cat from the real world can talk over there, and tells Coraline to leave for her own good, but Coraline doesn't listen. 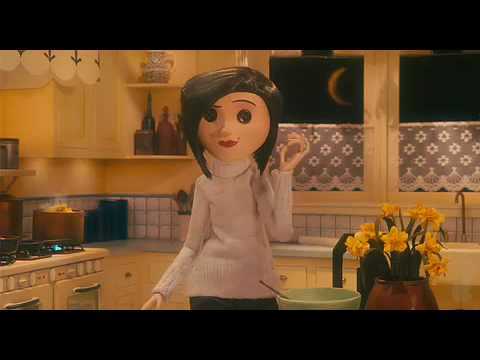 The Other Mother likes Coraline so much that she tells Coraline that she can stay forever if she just sews black buttons over her eyes. 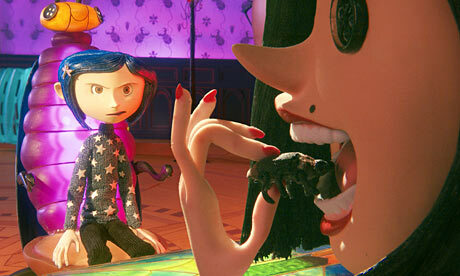 This frightens Coraline, and she wants to leave, but the Other Mother suddenly transforms into a horrible witch. She traps Coraline in a small room behind a mirror, which already has the ghosts of other children who can't leave. Wybie helps Coraline escape, but when she gets home, she finds her real parents gone, kidnapped by the Other Mother. 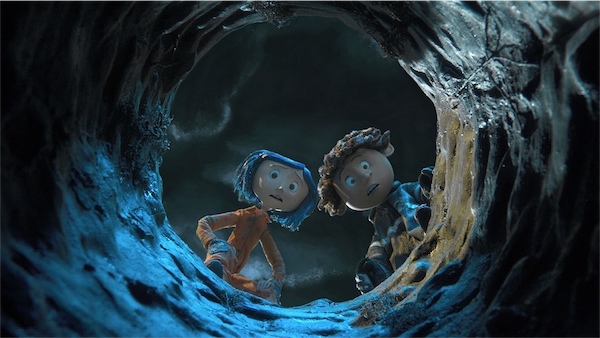 Coraline is given a "seeing stone" with special powers by Miss Spink and Miss Forcible in her own world and crosses back over, determined to use it somehow to save her real mother and father and the detained children. Using this tool, she wins a challenge against the Other Mother, but finally realizes that the Other Mother never intends to let her or anyone else leave. She has to come up with a way to trick the Other Mother into releasing everyone and staying forever in her own world. 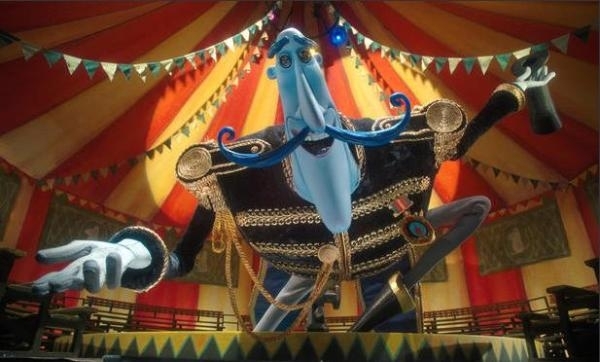 "Coraline" is enhanced by a great soundtrack. The band They Might Be Giants worked on some songs for the film, though ultimately only one song was included. French composer Bruno Coulais composed the remainder of the soundtrack with a unique style that perfectly complements the action. The film is a marvelous technical achievement, the first stop-motion animated film to be shot entirely in 3-D.
Creepiness abounds in this film, and the pace is slow and deliberate to allow you to marinate in the peculiarity of the characters and weirdness of the situations. While not your typical fairly tale, it has a splendid heroine who just wants to be loved, as in most classic fairy tales. 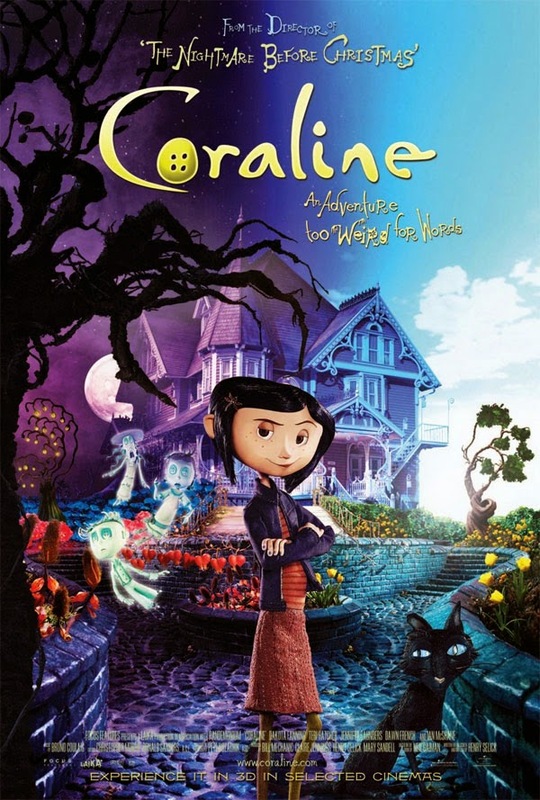 It can be a bit slow in places, and the story is a tad thin, but it is enjoyable to sit back and watch each new adventure that Coraline encounters. The 3D is particularly valuable in this film. It gives a dimension to the miniatures that makes everything seem more real. The downside is that this is a very dark, spooky film that may not be appropriate for the youngest children. Focus Features went to a lot of trouble to make this film as creepy as possible, and for that they are to be commended, but that also might make for nightmares for a young child. It may be perfectly appropriate for everyone you know; but, then again, it might be fine for you but not so fine for the local five-year-old. The voice work adds to the moody atmosphere, with Keith David's baritone underlining the cat's warnings and Robert Bailey, Jr. making Wybie sound as scared as he looks. Teri Hatcher's voice is almost (but not quite) unrecognizable, which adds to the malevolent atmospher. As an animation film aimed at an older audience, this is a near-classic. Many consider this director Selick's best work. If you are in the right mood, you could pop this in right after his "The Nightmare Before Christmas" and "The Corpse Bride" to keep the mood going, and maybe even intensify it.